In this 1490 version of Saint Sebastian by Mantegna the figure has one leg in the "picture", so to speak, framed by the marble, with the other stepping out of it into the space in front of the picture. He is in two realities at once. And while his figure in the picture looks flat like a painting, the arrows are drawn with astonishing perspectival illusion. They seem to start in our space well in front of his left leg and veer towards his body as though they were the artist's brushes applying paint to his figure. 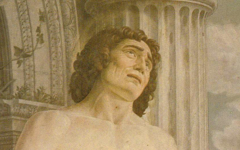 In this manner Mantegna has fused the space of the "studio" (in the foreground) with the "painting" in the painting framed by the marble. Also worth noting is the lowest arrow whose feathers are the only one to display so much red. 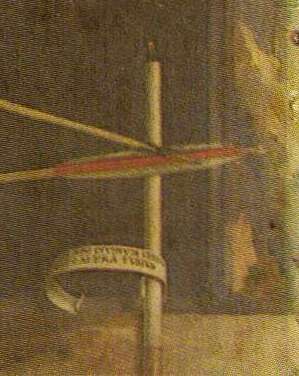 And it crosses the post around which Mantegna’s signature is furled. Attached to the upright of this implied Cross, the red takes on further significance as Christ's and is, I believe, intended to suggest the Christ-like nature of an artist's mind at the moment of conceiving a masterpiece. 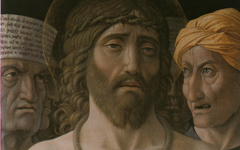 Durer's 1500 self-portrait as Christ is considered most unusual. He was not alone. 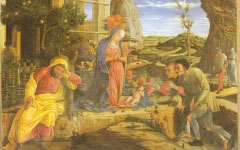 Joseph, worth only a cameo appearance in the Bible, is a major star in visual art. Cast as a narcoleptic, he falls asleep in one image after another without any art historian, to my knowledge, pausing to ask: Why does he sleep so much?